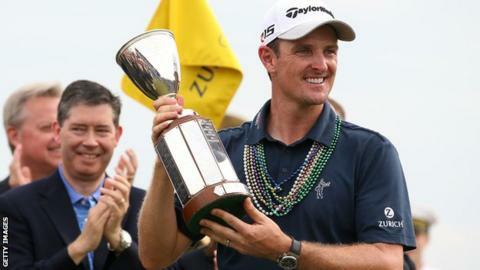 Justin Rose's latest victory provides further evidence he is not only a brilliant golfer, but one of the strongest competitors in the game. The South Africa-born Englishman's triumph in New Orleans was the 18th of his professional career. It was a gutsy display that told plenty about the tough-as-teak temperament of someone otherwise regarded as the Tour's 'Mr Nice Guy'. Both facets were evident in Louisiana. As soon as he had completed his final-round 66 to finish on 22 under par, Rose was signing autographs, taking selfies with fans and posing for photos with adoring children. He saluted his sponsors, who also happened to be the tournament backers. There were nods of gratitude to all and sundry as he maintained a typically gracious and professional persona. Only when Jason Day missed the green with a two iron on the last that needed to yield an unlikely albatross to force a play-off did Rose acknowledge his seventh PGA Tour title. More significant was the ferocious fist pump that greeted the 13-foot birdie putt he had rammed home to complete his round. That was the mark of an arch-predator scenting the blood of victory. Rose knew he needed a strong finish and convinced himself to go for the flag at the long par-three 17th, when every instinct was telling him to bail out to the safe portion on the right side of the green. His five iron duly rewarded his aggressive game plan and his putting touch was secure to convert the first in what proved the birdie-birdie finish he needed. You can afford to take the brave option when you have become an established winner like Rose, but the chance still has to be taken. This was his first tournament since finishing second to Jordan Spieth at the Masters two weeks earlier. That was another highly impressive performance, beaten only by the young American's record-equalling display. Rose could only draw confidence from his four rounds at Augusta, where he finished 14 under par, four shots behind the 21-year-old champion. As he headed into the final round there, I felt Rose might be capable of doing as Sir Nick Faldo did to Greg Norman in 1996, overturning a sizeable 54-hole deficit through force of personality. Few players come close to Rose's level of mental strength these days, and it is well respected in the locker room. It was no surprise he opened with consecutive birdies on the final day at Augusta. Spieth, however, was creditably equal to the onslaught. At 34, Rose is at the height of his powers and knows it. Now is the time to make hay and capitalise on winning opportunities that come his way. Hence his ruthless finish at TPC Louisiana, where he set a new record low score at the famous course. This is a player convinced of his technique and ability to hold his nerve. Yes, he had a rocky patch in the early part of the season but he refused to panic. He overcame a freak wrist injury and some uncharacteristic missed cuts to play his best Masters to date. And victory in New Orleans means he has won at least once every season for the past six years, a record only Dustin Johnson, who is on an eight-year streak, can beat. Among Rose's wins are the 2013 US Open and WGC Doral title a year earlier. He is not afraid to win the biggest tournaments. But sometimes it feels as though he does not get the credit he deserves from British sports fans. There are those who use his birthplace as reason not to support him. Try selling that idea at North Hants Golf Club - in the south of England - where Rose learned so much of his game. Britain should be very proud of a man who has become an exemplary champion; a superb ambassador off the course and a ruthless and feared competitor inside the ropes. Yet Rose is a rare beast in being a British major winner without having received recognition in any official honours list. I am not saying he should be handed an MBE, or whatever, for winning the New Orleans Classic, but his career as a whole has become a seriously impressive body of work. That it has not been formally recognised appears an erroneous anomaly in need of correction.